Brian H. Peterson has been an artist, curator, critic, and arts administrator in the Philadelphia area for more than three decades. He’s had over thirty solo exhibitions of his photographs since 1980, and his work is in the collections of the Philadelphia Museum of Art, the Amon Carter Museum, the Library of Congress, the Virginia Museum of Fine Arts, the Denver Art Museum, the Milwaukee Art Museum, the New Orleans Museum of Art, the Dayton Art Institute, the State Museum of Pennsylvania, the Danforth Museum of Art, and the Free Library of Philadelphia. He worked as a curator from 1990 to 2013 at the Michener Art Museum in Bucks County, Pennsylvania, where he organized numerous historical and contemporary exhibitions including major retrospectives on painters William Lathrop (1999), Robert Spencer (2004), and Charles Rosen (2006). 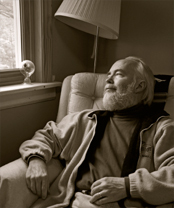 He was the editor and principal author of the 2002 publication Pennsylvania Impressionism (copublished by the Michener and the University of Pennsylvania Press), and his recent exhibitions included The Painterly Voice: Bucks County’s Fertile Ground (2011-12) and Making Magic: Beauty in Word and image (2012). His memoir The Smile at the Heart of Things (2009), was copublished by the Michener and Tell Me Press, and reviewed in USA Today, The Philadelphia Inquirer, The Trenton Times, and numerous other publications and blogs. His most recent book, The Blossoming of the World (2011), also was published by Tell Me Press. Peterson was a member of the Museums Panel of the National Endowment for the Arts in 2003, and has served on the Visual Arts Advisory Panel of the Pennsylvania Council on the Arts. He received two Fellowships for Visual Arts Criticism from the PA Council on the Arts, and his critical writing has appeared in The Los Angeles Times, American Arts Quarterly, American Art Review, The Photo Review, and The Philadelphia Inquirer. He was the Founder and Project Director of the Photography Sesquicentennial Project, the Philadelphia-area’s major cooperative celebration of the 150th anniversary of the birth of photography funded principally by The Pew Charitable Trusts (1988-1990). He taught photography for more than twelve years, at the University of Delaware, the Tyler School of Art, and Swarthmore College. He received a Master of Fine Arts from the University of Delaware (1985), and a Bachelor of Arts (in music composition) from the University of Pennsylvania (1981).